It’s been a long time since I posted something programming related here, but luckily, I found some precious little spare time this weekend. I used to run a portal a while back and a portion of it (namely the login system) was converted to the Provider Model back in the early 2000’s. And that’s where it stood for the better part of a decade. Even after the portal became defunct, I thought about dusting off the old code and reusing it in something. Yesterday, I decided to rewrite the Membership Provider into a LINQ to SQL model. The following is the end result of an afternoon of conversions. It still hasn’t been fully tested and may contain bugs, errors or other terrible things. And of course, there is plenty of room for improvement. As you can see there are parts that are missing, but the protions that pertain to the code below are included. 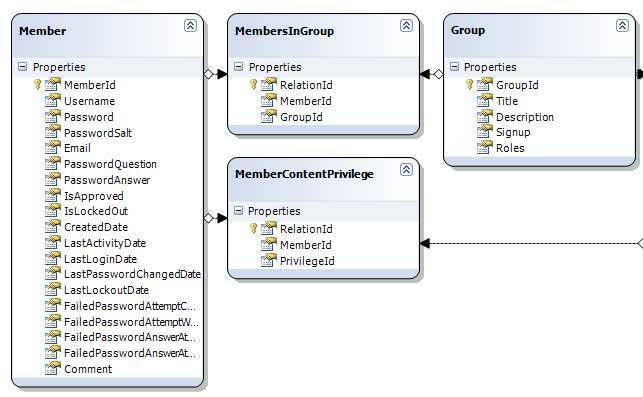 The MemberContentPrivilege class is based on individual privilege flags and there’s a matching GroupContentPrivilege class as well (not pictured). I created my CMS (called Osiris) originally with ASP in mind. But then with the arrival ASP.Net 2.0, I had the chance to use the existing role based authentication. With updates to the provider model, I kept changing the database until each role and a small number of users had a set of privilege flags with matching content IDs. It was far more granular for my purposes than the default RBAC in the Provider Model. You can, of course, delete those role specific code sections. I’ve marked them with a link to this post. I’m still not too comfortable with the WordPress source code formatter, so I’d be careful when copying. I decided to scrap the global DataContext object and went with the “using” method instead. I think this will prevent memory issues. * User related methods : create, update, unlock, delete methods. // Return status defaults to false. // When in doubt, always say "NO". /// Change the current password for a new one. Note: Both are required. /// Gets the total number of users that are currently online. // This is a non-standard helper setting. // If no format is specified, the default format will be hashed. /// Decodes a given stored password into a cleartype or unencrypted form. Provided it isn't hashed. /// Used in the initializtion, key in web.config or the default setting if null. /// Upon a successful login or password reset, this changes all the previous failure markers to defaults. This entry was posted in Computers, Open Source, Technology and tagged C Sharp, LINQ, LINQ to SQL, Membership, Membership Provider, Programming, SQL. Bookmark the permalink. Can you post the .cs file with the code in it. If you copy the code above, it copies all the line numbers. Actually, I just found the viewsource button and takes care of what I needed.